The Buck Commander crew won a Golden Moose Award this past winter, the Fan Favorite Best Overall Series. Seems Duck Commander’s Willie Robertson and his Duck Dynasty family are everywhere lately. From hats in convenience stores to door mats at Wal-Mart. 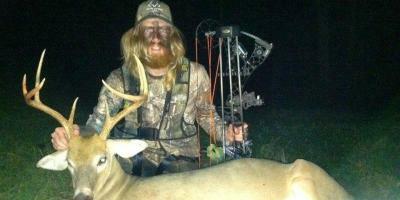 But Willie and his baseball/bow hunting brethren are also the Buck Commanders. Baseball stars Adam LaRoche, Ryan Langerhans and Tombo Martin and country music stars Luke Bryan and Jason Aldean team up with 'Boss Hogg' Willie Robertson in "Buck Commander Protected by Under Armour." then give a like to the Buck Commander Facebook page.